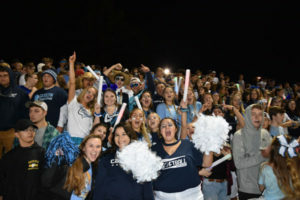 The Catoctin High School (CHS) 2018 homecoming activities were held on Friday, October 5, 2018, before and during the Cougar’s varsity football game against Rising Sun, which the Cougars won 33-13. Before the game, a Homecoming parade was held for the first time in several years and featured Cougar students infused with school spirit. The half-time Homecoming ceremony began with introductions of the Catoctin High School Administrative Team and Athletic Directors: Assistant Principals, Jason Lininger and Mary Jacques; Principal Bernie Quesada; Athletic Director, Keith Bruck; and Assistant Athletic Director Kim Flabbi. 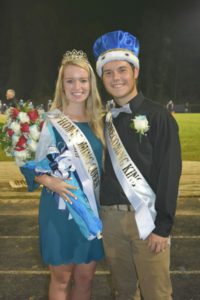 Catoctin High School’s first Homecoming Queen (Fall 1971) Mary Ann Rice Clever crowned the 2018 senior king and queen, Logan Rickerd and Sydney Zentz (pictured above). Mary Ann traveled from Georgia to attend the ceremony to commemorate the 50th Anniversary of the opening of Catoctin High School. The underclass princes and princesses were: Freshman Prince—Logan Simanski, Freshman Princess—Danielle Baker; Sophomore Prince—Bronson Snurr, Sophomore Princess—Alexia Healey; Junior Prince—Owen Bubczyk, Junior Princess—Maddie Williams. The Senior Homecoming Court nominees were: Pablo Archila, Mark Rogers, Isabel Stydinger, Hannah Hartness, Chase Wilhelm, Caroline Michael, Hunter Grimes, and Hannah Boone. CHS 50th Anniversary activities continue throughout the year, with acknowledgements during each sport’s senior nights and commemorative t-shirts and sweatshirts available for purchase. If you are interested in purchasing t-shirts or sweatshirts, please contact Kathy Herrmann at kathleen.herrmann@fcps.org or 240-409-9434. 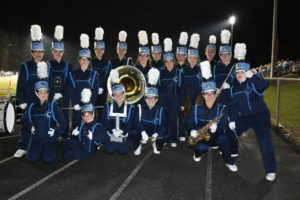 Catoctin High School’s Marching Band performs during halftime.